Home » Contests and Critique » How Was This Picture Made #08? For Part 8 of our How Was This Picture Taken? series, I have chosen the following photograph to share. On two recent road trips into the desert near my home base in Southern California, I had the pleasure of going on two landscape photo shoots, both of which I plan to write a photo essay for Photography Life readers very soon. In the meantime, I thought it would be fun and educational to post one particular photograph and invite our readers to share their thoughts on how this photo was visualized and constructed. Also, I thought that by sharing technical aspects on the making of this photograph in advance of my upcoming essay, the narrative and images in my essay might be aesthetically richer. What mood is conveyed by this photograph? That is, what was the photographer feeling and seeing at the decisive moment of opening the shutter? And what do you, as the viewer, feel and see with this photograph? What tools were used to construct this photograph, and what could have been the rationale for these tools? Is there any salient feature of the lighting used? Any thoughts on the exposure strategy? Any thoughts on post-processing, if any? Of note, this past week I had already posted this photo to my one-line photography galleries along with salient information on this photograph. Although I always welcome visitors to my galleries, I would kindly ask our readers to temporarily resist the temptation to view this photograph on my gallery and then promptly return to regurgitate the details in the comments section below, which would defeat the purpose of this exercise. Please, check back at the end of this week for my thoughts on the making of this photograph. This may not be your intended mood, but — having recently taken photos at sand dunes myself — the first thing I notice is the marred sand from tire tracks and footprints. For me, that was the most frustrating part about taking pictures at sand dunes. 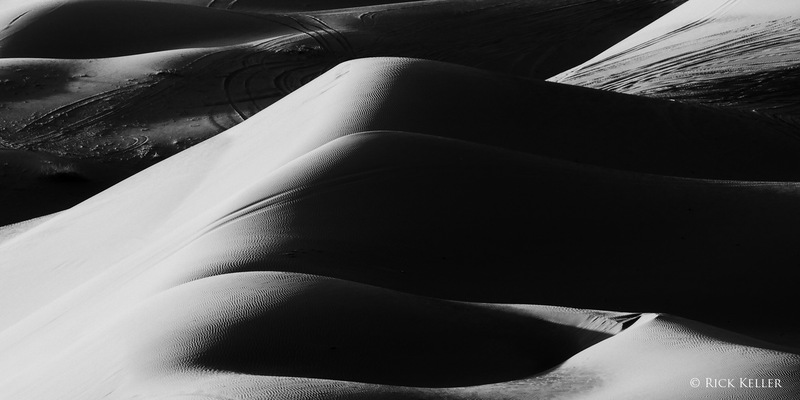 I see this photo almost as if the tallest dune, which does not have very noticeable tracks, is “rising above the fray.” I think this is a beautiful capture. I could not see images for this post or any saved PL posts. Please tell me how to fix this. Thanks. Same issue here in souther Wisconsin. Have not been able to see images in any of the posts for the past 4 or 5 days. looks like it is either sun-set or -rise time and potentially two pictures overlayed in some way? 1. The mood: The mix of natural dimples in the sand mixed with ugly prints of tires shows that man indeed spoiled even the most desolated places. 2. Tools: I would say that the shot was taken either late afternoon or in the moonlight. If was taken in day time a filter was used to limit exposure. If it was taken at night, a tripod was used. By the lack of dust flying I would guess moon light (wind is generally stronger at day time in the desert). 3. I would say the the important feature for lighting was the moon…Although…the lighting reminds me of the effect night pyrotechnic have. Like the ones the army uses to brighten the night (Can’t think of the word). But most likely the moon. 4. Exposure is tricky. If it’s day time it’s probably around 1/4000 sec. maybe even 1/8000 sec. (f/16). The shadows are very deep compare to the bright areas. If it’s moon light I would guess 1/15 sec. 5. Post processing was probably just making it black and white. Although, if taken by moon light there would be no need. 2. EXIF data indicates the use of a NORITSU KOKI QSS-32_33 minilab, suggesting that this image was scanned from either a film negative or print. That’s all I’ve got… so far. The photographer spotted a highly contrast and symmetrical element in the scene so he decided to give it a click. I saw a lot of images of sand dunes perfectly smooth without foot prints and tire tracks, I love naturalistic imagery so I really like this one. The lighting was highly contrast to the extreme. Highlights and shadows are both clipped. B&W film was used. Image was scanned. Maybe some amount of sharpening was done in PP. Looks like film with really huge dynamic range, so it’s not gonna be tri-X or HP5. I’ts not pushed either for contrast because you really have some (little clipped) intense dark blacks. Dynamic range of the scene is really high and there is much much detail preserved in the midtones of the background and shadows. So you surely exposed for darker midtones on a high latitude film. There is much highlight detail on the bottom right but on the bottom left there is some clipping because of that I don’t think that you shot medium format film as latitude for highlights might have been even better then. It’s hard to say though this might also be an effect of scanning and setting black and white points. I’d still go with 35mm though.There is hardly any grain at all so my guess would be a low ISO film like Kodak Tmax 100ISO pulled one stop or Ilford PANF plus at ISO 50. Both have exceptional dynamic range and great midtone detail as well. You used very low f-stop for DOF so shutter speed was low and you set up on a tripod for sure.